recruitment consists of vacancies for Backlog, Promotion or Retirement vacancies and newly available posts. The eligible candidates can apply through the official website of www.mpoline.gov.in on or before 10-05-2018 for this MPPSC Govt Degree Colleges Assistant Professor Jobs Recruitment Exam. 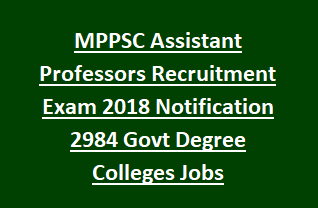 For more details regarding age limits and educational qualification, examination pattern, selection procedure and other details of Govt Degree Colleges Assistant Professor jobs of MPPSC recruitment exam notification please see the information below. Click here to see the official advertisement of Govt Degree Colleges of Madhya Pradesh Assistant Professors Recruitment 2018. There are total 3422 vacancies available in Government Degree Colleges of Madhya Pradesh Higher Education Department Assistant Professors. There are three categories available in this recruitment. Department Name: Madhya Pradesh Government, Higher education department. Complete details of education qualifications are given in official notification. The candidates must have qualified master's degree in the relevant subject which he/she is going to apply. The candidates who are applying for the posts of Physics, Chemistry, Mathematics, Geology, Zoology, Defense studies, Earth Studies, Dance they must have qualified the UGC NET or CSIR UGC NET exam. As on 01-01-2018 the candidate age limits are 21-40 years. For outside candidates of Madhya Pradesh age limits are 21 to 28 years. Selection for this MADHYA PRADESH Assistant Professors recruitment is held based on written online examination and a personal interview. After selection or receiving appointment letter the candidate has to join immediately. For the candidates of General & outside candidates of MP Application fee is Rs.1200/- and for all the others is Rs.600/-. The selection process will be held in the process of 2 stages. One is online written test and another one is personal interview. Written examination will be conducted for 400 marks having 2 papers. Paper 1 consists of 100 marks. Paper 2 consists of 300 marks. Paper 1 consists of General Studies having four parts. Paper 2 exam syllabus will be related to the Subject. The candidates have to apply through online only. Offline mode is not accepted. Before applying online must read the official notification and instructions to apply online. There is no need to send the hard copy. Click here to apply online for the Madhya Pradesh Public Service Commission Assistant Professors Recruitment 2018. Please share this MADHYA PRADESH Assistant Professors Recruitment Exam 2018 article to your lovable friends through online via social web.